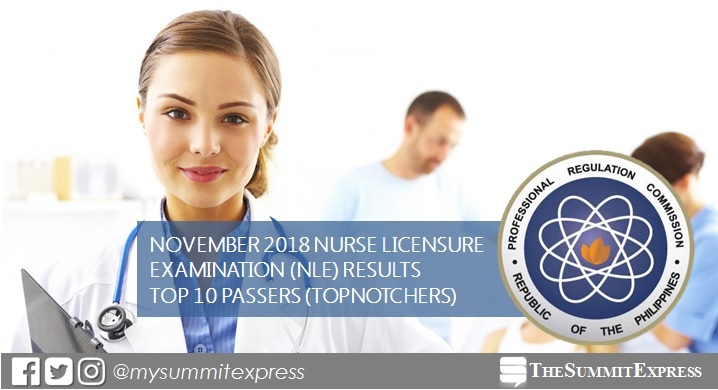 MANILA, Philippines – The full list of topnotchers or top 10 passers in the November 2018 nurse licensure examination (NLE) or nursing board exam is available on this page as officially released on Friday, December 7, 2018 or in 14 working days after the last day of exam. The Professional Regulation Commission (PRC) recognizes the highest placers of November 17 and 18, 2018 NLE, which was conducted in various testing centers nationwide: Manila, Baguio, Cagayan De Oro, Cebu, Davao, Iloilo, Legazpi, Lucena, Pagadian, Tacloban, Tuguegarao and Zamboanga. In the same period last year, Raymund Kernell Balmaceda Mañago from the University of the Philippines (UP) - Manila aced the board with 89.00%. It was followed by Veronica Louise Ganalon Necor of University of Santo Tomas (UST) with 88.80%. In the November 2016 exams, Eric Carolino Jacinto from Saint Louis University (SLU) and Faith Calzado Rutagines of UST topped the NLE garnering identical grade of 86.60%. Benedict Mark Magat Bunal of UP-Manila and Augustine Beth Dionisio Cortez of UST ranked second with 86.20%. Monitor this page for the real-time updates on nursing board exam results. Check out also the official website of PRC for more information.